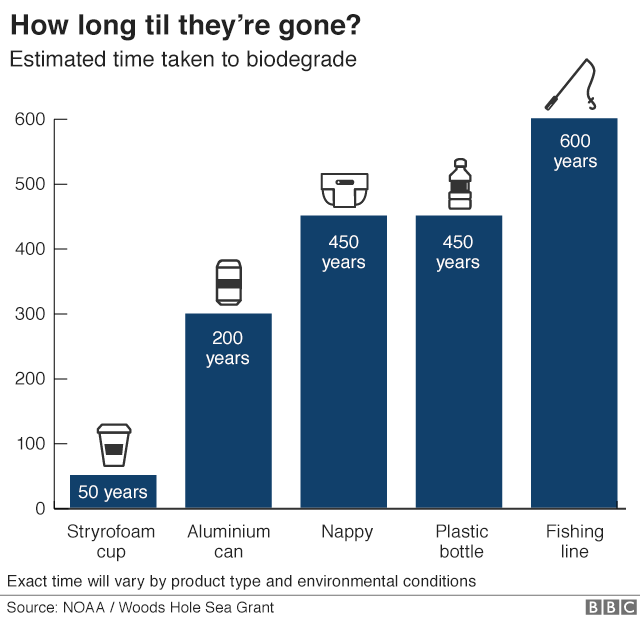 Marine life is facing “irreparable damage” from the millions of tonnes of plastic waste which ends up in the oceans each year, the United Nations has warned. “This is a planetary crisis… we are ruining the ecosystem of the ocean,” UN oceans chief Lisa Svensson told the BBC. One of the great advantages of many types of plastic is that they’re designed to last – for a very long time. 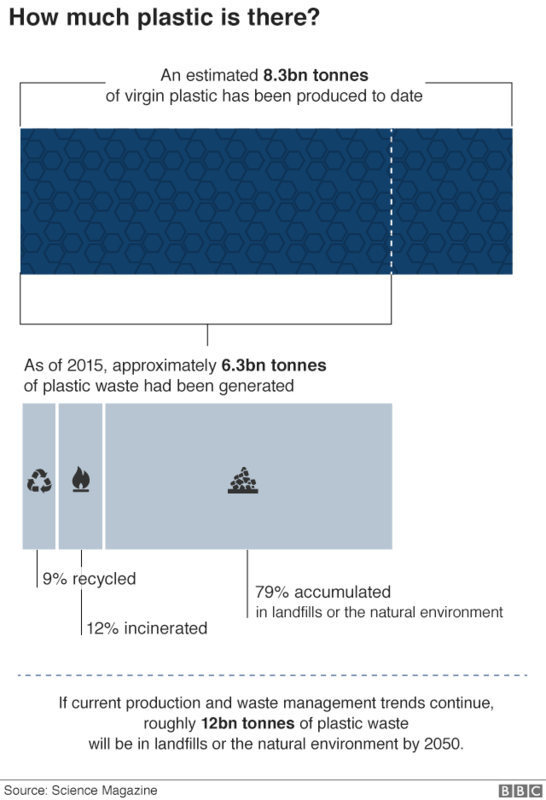 Of this, some 6.3bn tonnes is now waste – and 79% of that is in landfill or the natural environment. 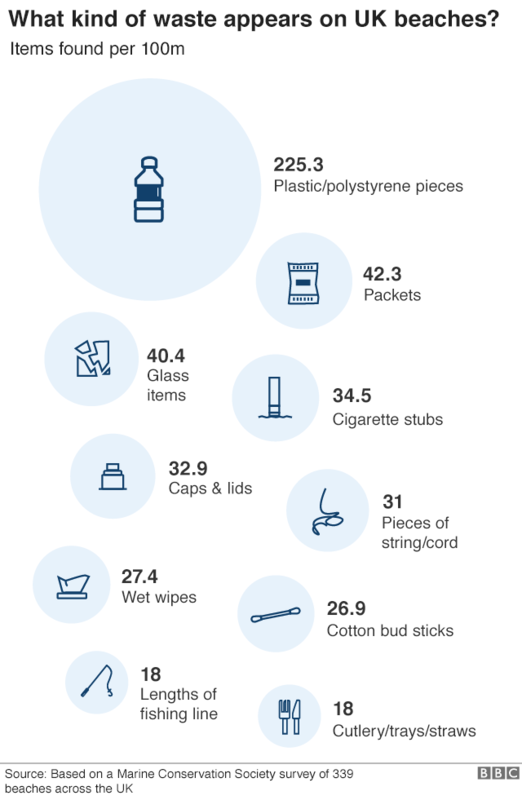 This vast amount of waste has been driven by modern life, where plastic is used for many throwaway or “single use” items, from drinks bottles and nappies to cutlery and cotton buds. Drinks bottles are one the most common types of plastic waste. 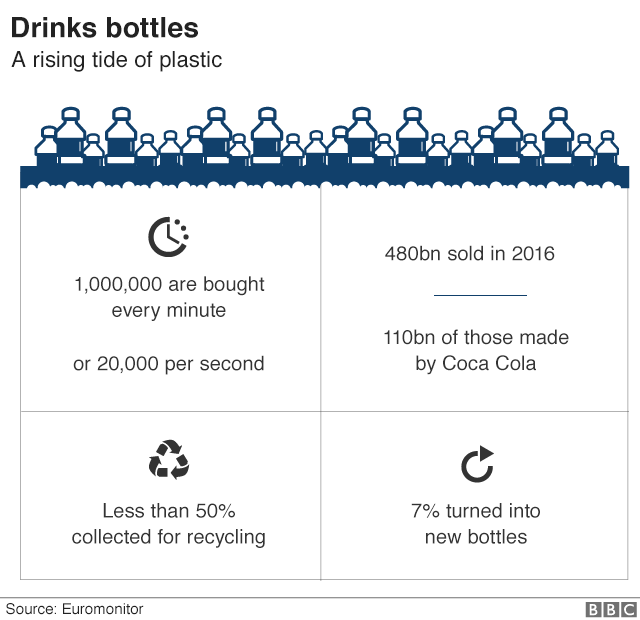 Some 480bn plastic bottles were sold globally in 2016 – that’s a million bottles per minute. 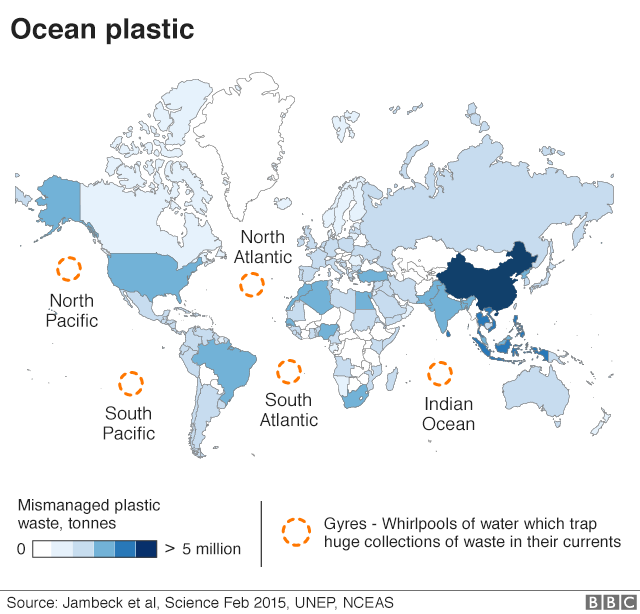 It’s likely that about 10m tonnes of plastic currently ends up in the oceans each year. They are made up of tiny fragments of plastic, which appear to hang suspended below the surface – a phenomenon that has led it to being described as plastic soup. However, there are moves to clean up the North Pacific gyre. An operation led by a non-profit organisation Ocean Cleanup is due to begin in 2018. 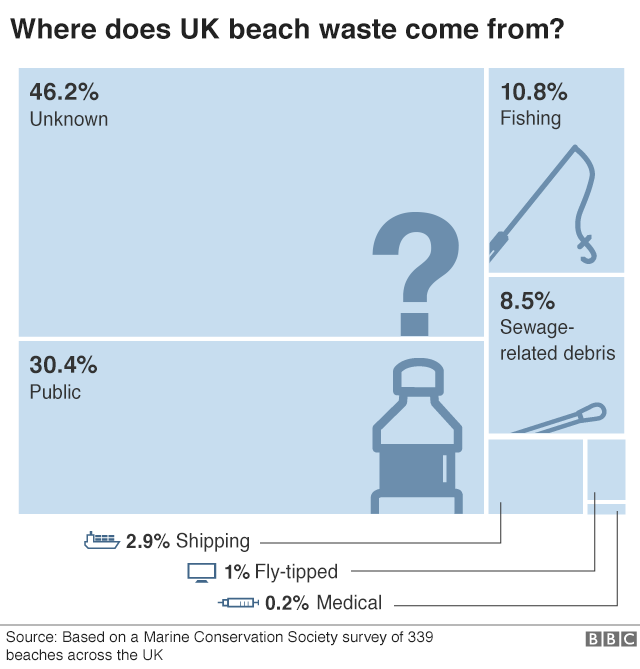 The Marine Conservation Society found 718 pieces of litter for every 100m stretch of beach surveyed during their recent Great British Beach Clean Up. That was a 10% increase on last year. The origin of a lot of the litter is difficult to trace, but the public contributes about 30%. “Sewage-related debris”, or items flushed down toilets that should have been put in the bin, amounted to some 8.5%. Turtles cannot distinguish between plastic bags and jellyfish, which can be part of their diet. Plastic bags, once consumed, cause internal blockages and usually result in death. 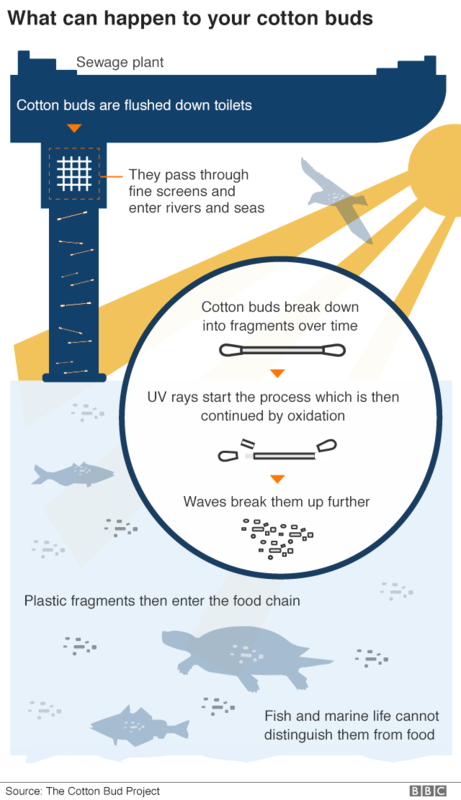 But in 2016 the European Food Safety Authority warned of an increased risk to human health and food safety “given the potential for micro-plastic pollution in edible tissues of commercial fish”.